Yeah, thats right, He-Man. 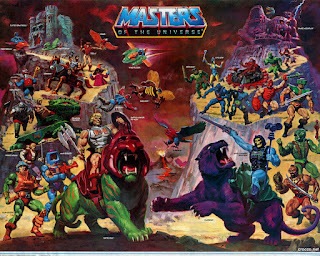 The MotU toys showed my 9 year old self that magic and technology could exist side by side, in the same world. Barbarians and sorcerers riding sky sleds and shooting ray guns and fighting the eternal battle of good and evil. I could craft those battles with my action figures for hours upon hours. 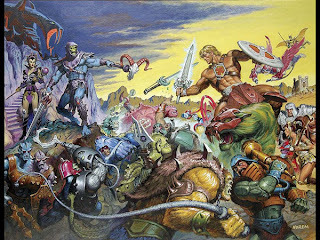 There are few things I find cooler than Magic vs Machine and He-man, and his allies and enemies, represents that battle in it's purest form. And then there's Eternia, the setting for this epic ride. A world rife with danger and ancient artifacts that can save or destroy untold universes. Castle Greyskull, whose mysteries could provide the brightest of hopes or the blackest of dooms. A Power Sword that could be split in twain. Snake Men from the primordial past. An invading Horde from another universe. Cosmic Enforcers whose true allegiances were nearly unknowable. Rumors even claim that the MotU toy line began development as a line of Conan the Barbarian toys. I can't think of a game that can't benefit from drawing upon my childhood memories of visiting Eternia.